The ultimate team up of epic proportions!! The team up of all team ups!!! A project so vast, it took two series to contain it!!!! Stussy and Marvel Comics present a project featuring characters from the Marvel Universe that are transported into the Stussy world. 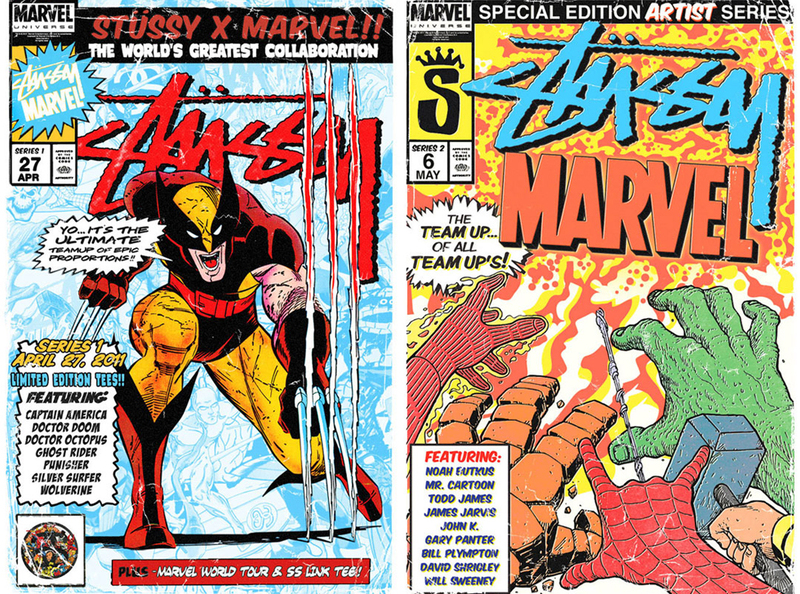 The first series Stussy x Marvel The Ultimate Teamup will be released on April 27th and combines vintage Marvel characters with definitive Stussy designs. These styles feature the looks from rare and collectible comic books and posters with Marvel superheroes such as Wolverine, Silver Surfer, Punisher, Ghost Rider, Doctor Octopus, Doctor Doom and Captain America. The second series Stussy x Marvel Special Edition Artist Series will be released on May 6th and features artwork by notable international artists Will Sweeney, David Shrigley, Bill Plympton, Gary Panter, John K., James Jarvis, Todd James, Mister Cartoon and Noah Butkus. There will also be some tees for the kids featuring the following designs – Captain America, Doc Ock, Silver Surfer, Wolverine, SS Link and Marvel World Tour. For the release of the project, we’re producing sets of limited edition trading cards that will be given away with each purchase. The cards feature the art used in Series 1 & 2 and include bios and fun facts for each guest artist, telling the story for the entire project. The Stussy x Marvel project is available now at Stussy.com US store, Stussy.com EU store, Stussy Chapter Stores and boutiques worldwide.